When it comes to fashion, blogger and socialite Sarah Langa can do no wrong. Her slayage is on another level and she proved this once again at the just concluded South African fashion week SS19. Influenced by the colour of Haig Club’s Whisky Bloody Sour, the fashion lover wore a layered head to toe red outfit that created a fierce and luxurious balance. 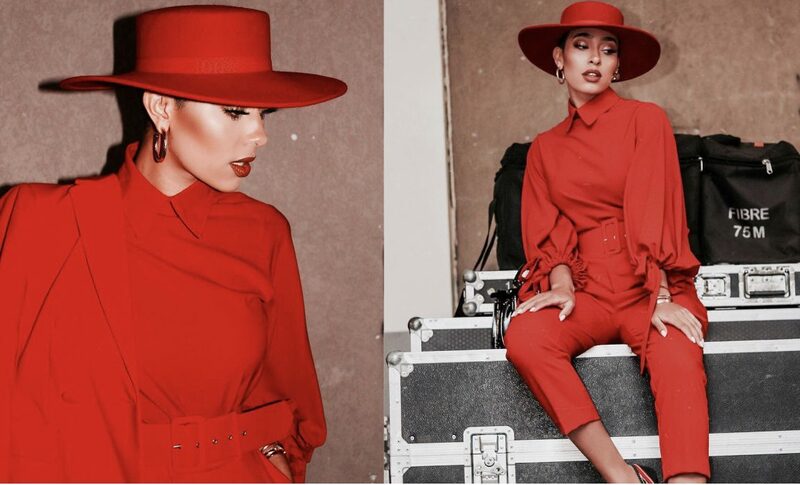 It is usually quite tricky to find a balance when assembling a boldly coloured monochromatic look, however, the style influencer’s all red combination – right from her hat to her pants – was simply perfection. Although she opted for a singular shade where every single piece matched, the overall look was far from overwhelming as each piece in her look had characters that defined them. For example, the blouse from Rich Mnisi came with an exaggerated sleeve. This extra detail added definition to her look just like her belted high waist pant. There was almost no other contrasting hue save for the printed heels whose colours including black, red and silver created the balance that the outfit needed. The ensemble could have easily been overwhelming but each piece proved that it could be seen at the same time even with a bold colour code at play.